CenTrak’s unique combination of its highly accurate room and bed level RTLS with Wi-Fi locating delivers a new alternative for the Healthcare market. (Newtown, PA – February 22, 2012) CenTrak, a leading provider of Real-Time Location Systems for healthcare, is pleased to announce availability of the first-ever combination Wi-Fi and Second Generation Infrared (Gen2IR™) solution as part of a unique platform that does not compromise on CenTrak’s best-in-class accuracy and performance. For the first time, the healthcare industry can enjoy broad access to Wi-Fi RTLS while having highly accurate Gen2IR™ technology to satisfy the types of use cases solution providers require for their valuable and innovative offerings. 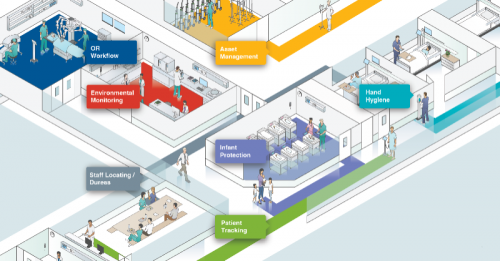 Early adopters of healthcare RTLS were often caught in a quandary – start with relatively simple to deploy, less accurate technologies with limited ROI, or invest in high accuracy high performance technologies that would unlock the true value of enterprise asset management and patient and staff workflow. CenTrak’s new platform removes the need for this type of compromise and prevents the dissatisfaction often associated with legacy RFID offerings. The new platform allows CenTrak’s 100+ solution providers to receive location data from an increasing number of generic Wi-Fi tags and Wi-Fi clients including Computers on Wheels, IV Pumps, and phones. The integration provides the same Gen2IR performance that CenTrak partners and customers have come to rely upon for addressing hi-resolution use-case requirements such as Hand Hygiene Compliance, High Acuity Workflow and Nurse Call Integration. The result is a future-proof RTLS platform that hospital executives can feel comfortable in choosing as their starting point for any RTLS initiative. “We are thrilled to be in position to offer a smarter, future-proof RTLS. Our partners’ valuable and often ground breaking RTLS-based solutions can now be easily extended. We feel privileged to be part of these solutions and to provide hospitals with a world-class platform in terms of scalability, accuracy and performance”, said Dr. Ari Naim, President and CEO of CenTrak.Stop by CenTrak’s Booth #3272 at HIMSS 2012 in Las Vegas to learn more about the new CenTrak solution.